On the most recent episode (Marco and the Polos 3: The Great, Great Khan), I briefly mentioned the comparison that was made in the Marco Polo text between Kublai Khan and the Southern Song ruler, and the way that ruler’s leisurely ways were blamed for his empire’s collapse. Here I’m going to talk about the end of the Song Dynasty, in Marco and otherwise. By way of introduction, Marco (I’ll address issues of authorship elsewhere; here, for convenience, I’m just going to speak of Marco as the narrator of the text) first speaks of the province of Manji, roughly the territory of the Southern Song, as being “the most magnificent and the richest that is known in the eastern world.” He says of it that “it was subject to a prince … who surpassed in power and in wealth any other that for a century had reigned in that country. His disposition was pacific, and his actions benevolent.” He was so loved by his people, his rule so just, generous, and charitable, and his kingdom so strong and secure behind its rivers and walls, that the prospect of any power rising to threaten him was thought to be beyond belief. And so he put aside thoughts of war and of arms and soldiers and was entirely content behind his fortifications to follow other pursuits, and the one which he pursued most of all was pleasure. Marco makes much of this prince’s (an emperor really) fleshy weakness, his surrounding himself with the 1,000 most beautiful women that could be found and delighting in their society, and the way they’d idle away the hours and days in the royal park, sporting and swimming and being served meals in its groves. And then he speaks of the emperor’s alarm when the khan’s men came for him. The army that approached was led by an accomplished general named Bayan and sometimes referred to in sources as “Hundred Eyes” (and in case you’ve watched the Netflix show and are wondering, he was not a blind monk and master martial artist). Bayan at first invited submission from the cities he approached, and then, at their refusal, selected one, took it by force, and slaughtered its inhabitants as an example to all the others. Open your gates to us, was his message, as clear as any written declaration, or we will come through them anyways, and kill you all. Quickly, cities began to do as he asked. And that was what really woke the Song emperor to the danger he was in. 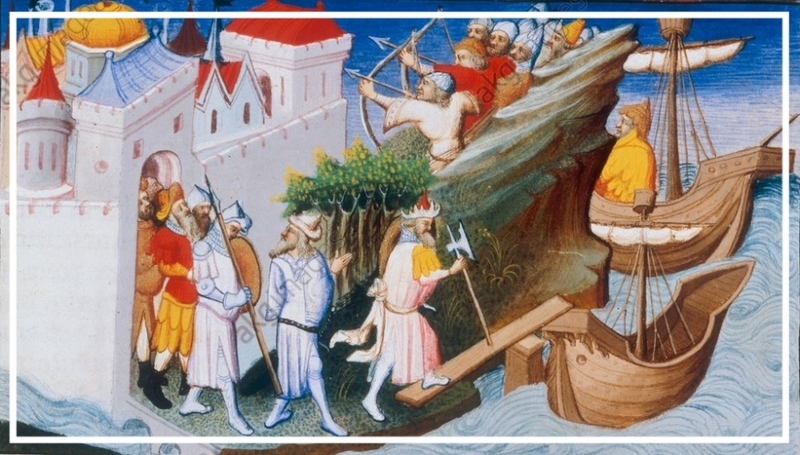 According to Marco, he abandoned his city and his wife, leaving the one in the charge of the other, and fled with his treasures and a ship rather than face the Mongol storm to come. What came next was a bit of a Macbeth scenario, if surprisingly less violent. The emperor’s wife was not so frightened as her hastily departed husband because she had heard from the astrologers, and the word was good. She had been told that no man could overthrow the emperor unless he was a chief with a hundred eyes, so things were fine for surely that would never come to pass. No, there was nothing at all to fear right until the moment a general with the name “Hundred Eyes” and a large Mongol army showed up at her gates demanding surrender. Promptly, she turned herself and her city over to Bayan and was shipped off to be brought before the khan. In Marco’s telling, that’s pretty much the end of the Southern Song. Marco uses all of this to contrast the emperor’s weak character and stricken realm with the warlike virtues of Kublai Khan (who also, it should be noted, hugely enjoyed the company of women and time in the park), but his depiction of the Southern Song’s final days was not accurate. It's true that there are stories about Song Emperor Duzong, who Marco is clearly describing, of how he neglected his empire for women and drink, and it’s true that when the Song capital was surrendered to the Mongol armies, a woman had a offered the capitulation. However, this was not some abandoned imperial wife, not in the way Marco imagined at least. In the summer of 1274, Emperor Duzong had not run away; he’d died after a reign of only 10 years. He’d left sons, but none were old enough to rule, and the imperial heir was only 4 years old. The powerful chancellor, Jia Sidao, was dead too, his failures against the Mongols finally giving his enemies, who were plentiful, what they needed to take his title and then his life. Power then was in the hands of the young emperor’s aging grandmother, Grand Empress Dowager Xie; she was the one who turned over the imperial seal to Bayan, when all other options for negotiation or resistance had been explored and she'd sent the emperor’s brothers safely away, and the one to journey with her grandson to appear before Kublai at Shangdu. In a sad postscript to the Song Dynasty story, those escaped imperial siblings did not live long and happy lives. Southern Song loyalists used them as figureheads and fought to keep the Song Empire alive. The older of the two died in 1278, his health collapsing after he’d narrowly escape a shipwreck and before he could turn ten. The younger boy died in 1279. His ships were attacked and sunk by a Mongol fleet, and the loyalist leader Lu Xiufu is said to have dove into the water with the little emperor in his arms when he realized that the end had come.